Want to build a website? WordPress Themes are what you need to get started with. WordPress themes are a complete package. They have all the tools you require to easily build your own website. These themes also give you an idea beforehand of how your website will look. Better the theme, more traffic it will generate. 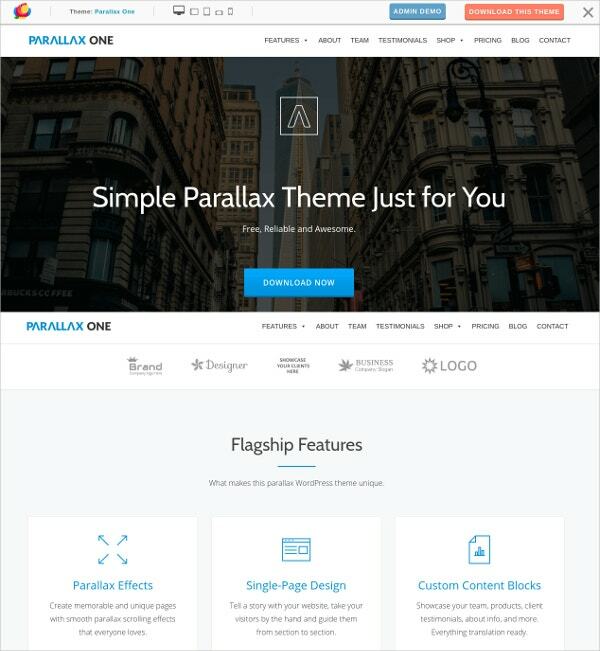 The one page Parallax Themes are really popular these days. They keep the visitors engaged by moving on the page to view different contents. 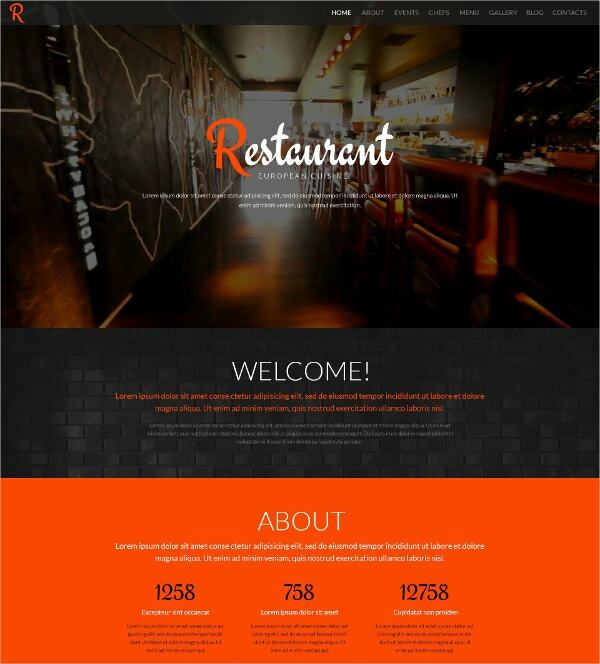 If you are planning to build a website for your restaurant this one page parallax WordPress theme is a must have. It is very attractive and has a responsive design visible on all devices and browsers. You can even upload a video of your restaurant in the background to make the site feel more lively and vivid. Contact forms are also available for people to contact you for queries regarding your restaurant. Have a small business and planning to build a website for it? 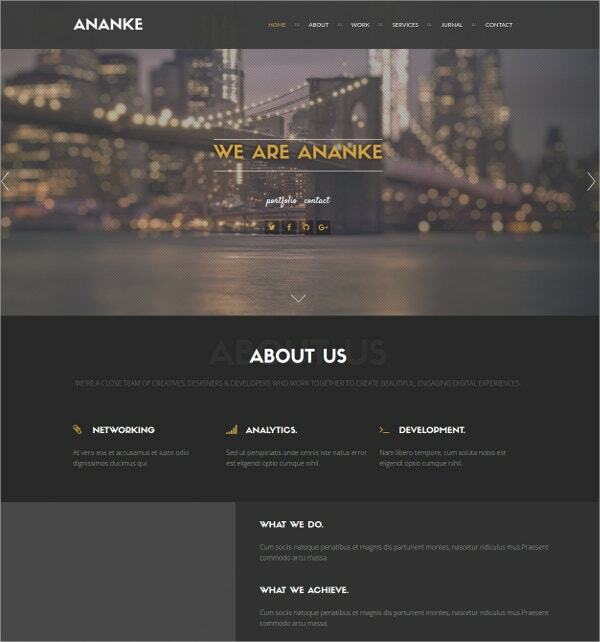 Ananke, a one page parallax WordPress theme is what you need. It is a beautifully designed theme which is best suited for personalized designer, illustrator and photographer portfolio and creative agencies. It is mobile and tablet friendly. 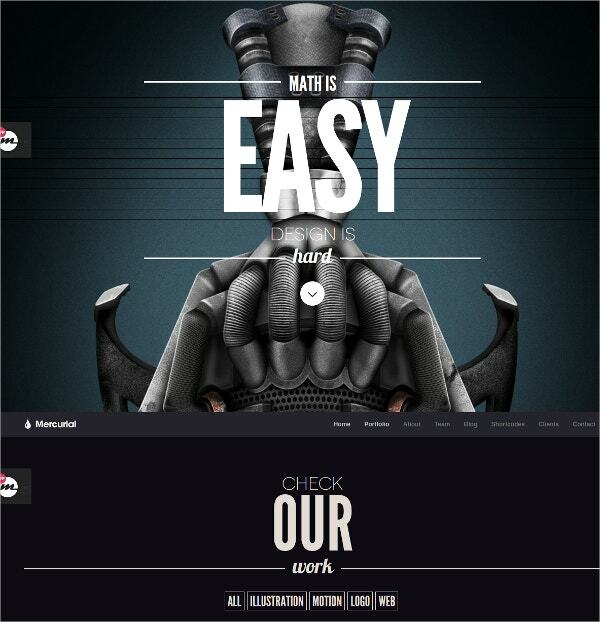 You can add animations in this theme to make your website look more attractive. If you have a business you want to promote then this is the one page parallax WordPress theme for you. 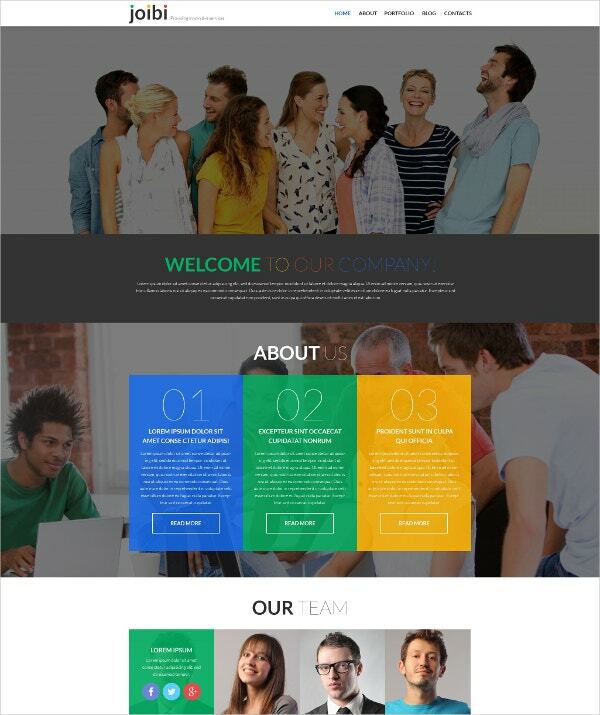 It is a nicely designed theme best suited to demonstrate the work of your organization. Preloaders, lightweight animation effects can be used in this theme to show different statistics concerning your business. Auto updater ensures that any update regarding the theme is automatically installed making sure your site is always updated. Google maps can also be used to show the location of the company to make it more credible. If you want to build a website for portfolio then Mercurial, a one page parallax WordPress theme is the perfect choice for you. It has a very artistic look and its custom shortcodes can be used to create amazing typographic effects and insert portfolios and skill bars along with client’s logos. Social sharing icons can be used to add the website to your Twitter and Facebook feed in just seconds. 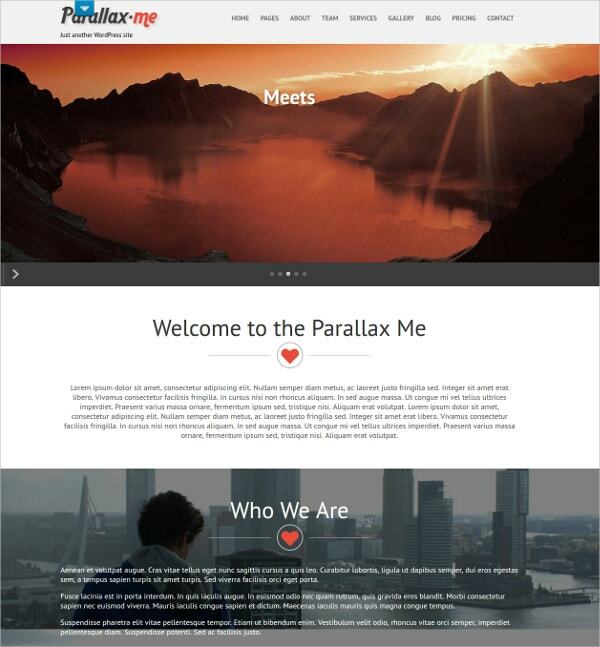 You may also see Premium Parallax WordPress Templates. Need to create a website for hiring or referring people? Take a look at this one page parallax WordPress theme which can be used to create a job portal website. 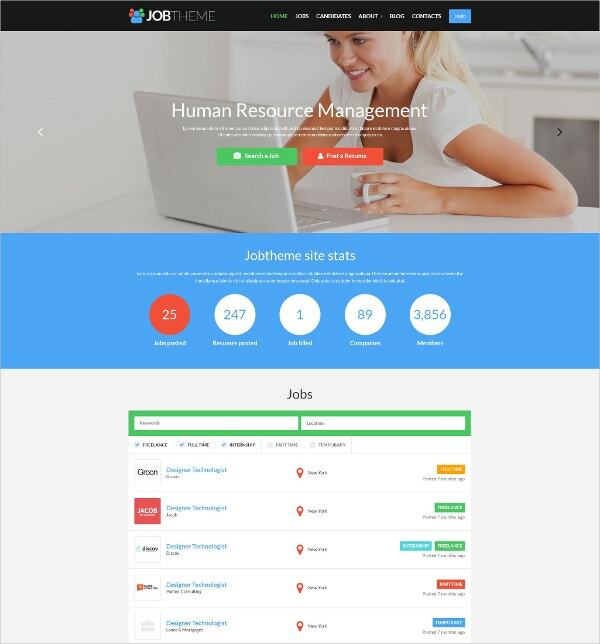 This theme can be used to create a website where you can upload your resume, check out available jobs and apply to them as well. You can also put up contact forms for interested candidates to contact you to clear their various queries. 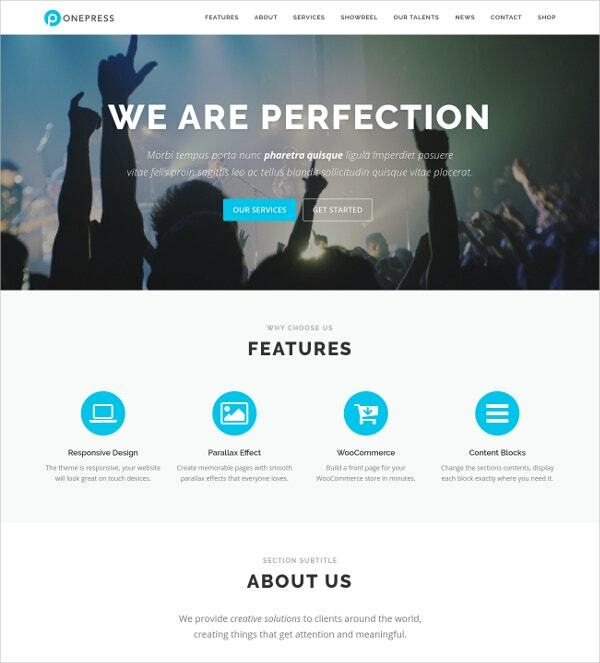 This is a one page parallax WordPress theme which is sure to leave a mark on the visitor. It is named Surreal and it’s qualities justifies its name. It is very artistic and has been very creatively made. Parallax effects on the background images are sure to leave the visitors astonished. This theme comes with lifetime free upgrades as well. You can choose from multiple color and font options to customize your website. This one page parallax WordPress theme is best suited for you if you want to create a website for portfolios. You can use it for your talent agency to publicize your clients or you can use it to create a website about yourself and use it as your resume. It is easy to install and customize. Do you want to build a website that demonstrates your creativity or that of your company? 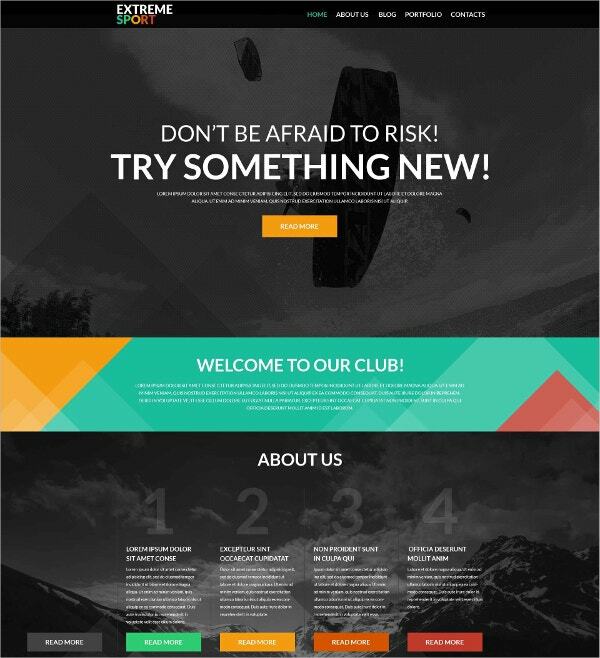 If yes then this is the one page parallax WordPress theme you should go for. It has a responsive design compatible for all types of browsers on all devices. Choose from unlimited color options to choose the one you find the best for your website. Post latest news regarding your company to keep the visitors updated. The best part is, this theme is free of cost! 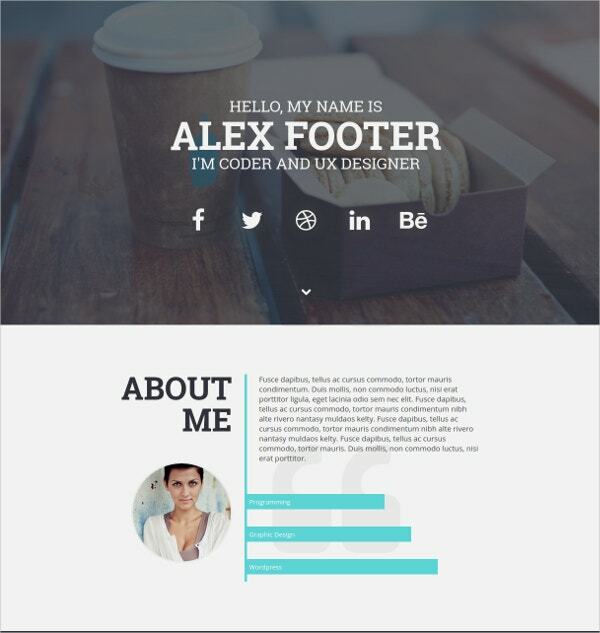 You can also see Popular Parallax WordPress Templates. This is a very elegant one page parallax WordPress theme which will help promote your business on the net with ease. The graphics are retina ready and the theme is fully responsive. It has different versions, a basic one which you can download for free, a professional one which you can download for $40 and a developer one which you can download for $70. The professional version has post format support and unlimited typography and colors while the developer version you can use for unlimited websites. Pixova, a one page parallax WordPress theme is one of the finest available currently. It can be used by individual freelancers as well as studios. Using videos and high resolution pictures you can give the visitors a visual feeling of your work. Built in search engine optimization settings can make sure that your site gets a lot of traffic and you get enough publicity. 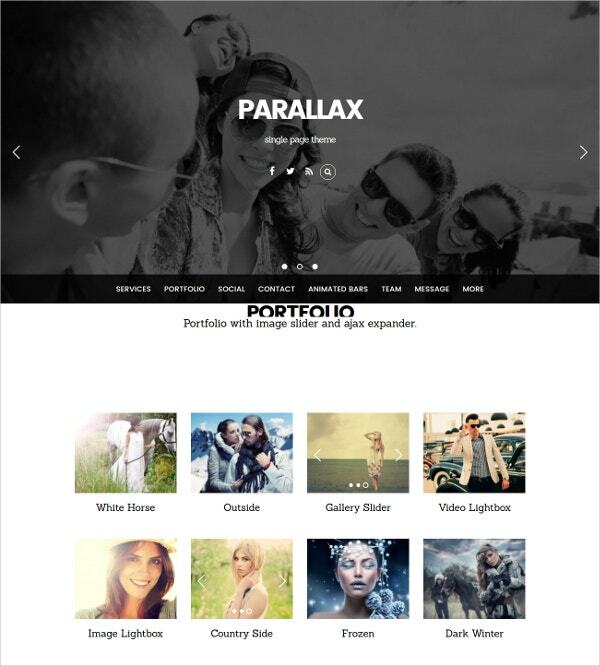 This one page parallax WordPress theme is best for making websites showing portfolios, perfect for creative agencies, modelling agencies, photography studios and even freelancers. A video is also available which can guide you step by step on using the theme. 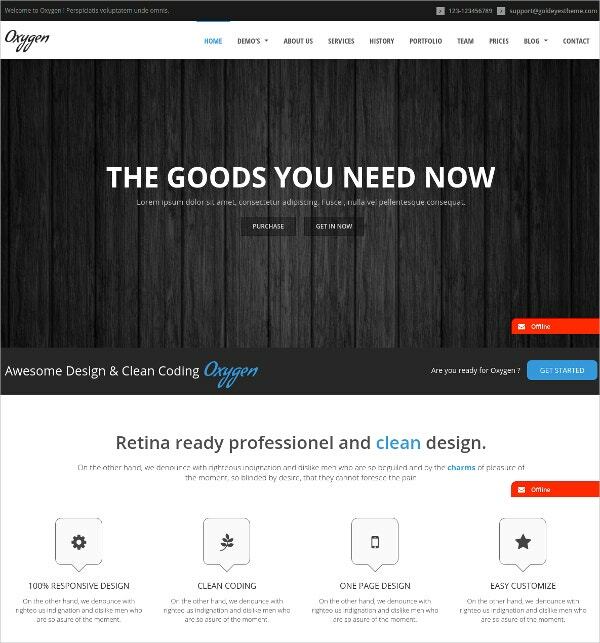 Over 40 pre-designed layouts are available in this theme, so you can choose the best for your website. 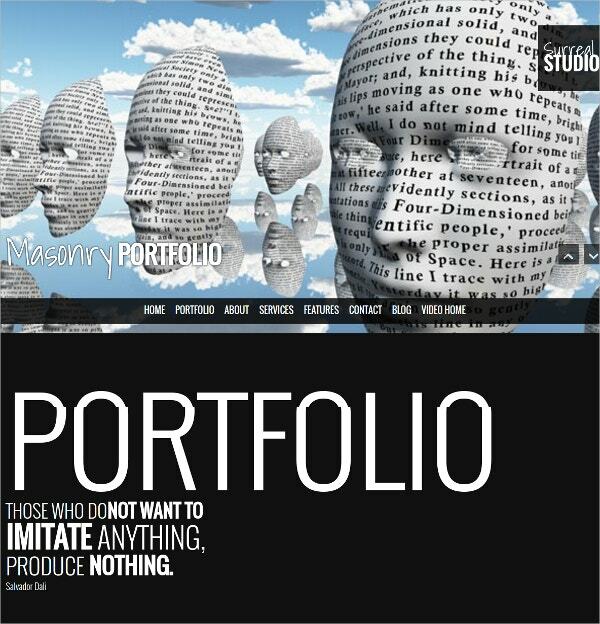 Videos, images and gallery sliders can be used to make the portfolios more interesting. Have a business related to sports? Are you a part of a sports club or a firm organizing sporting events for extreme sports? Use this beautifully designed one page parallax WordPress theme to make a website for your organization. Visitors are sure to get pumped up after watching the design of your website. This one page parallax WordPress theme can be used to create a very artistic website best for photography studios and freelance photographers. It is highly rated with more than 20 thousand users. You can use it to create your own website even without any existing coding language. It has a very helpful support center which is available 5 days a week. 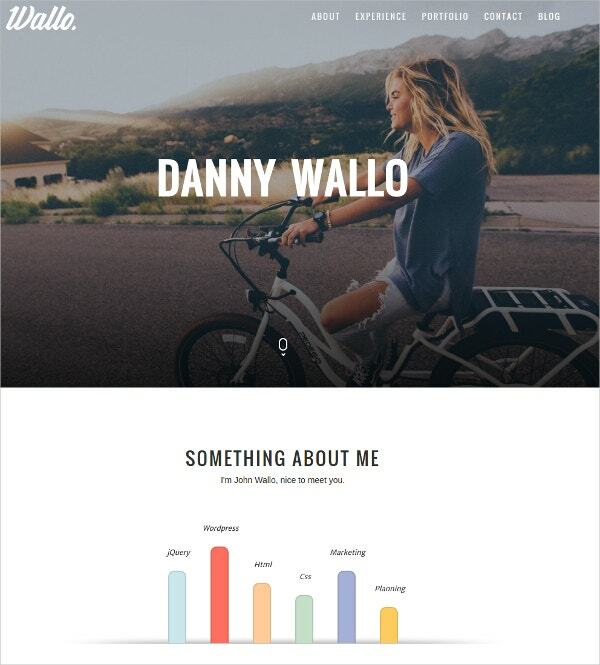 Wallo is a one page parallax WordPress theme that you can use to create a website about yourself. A website for a resume looks very well and if you want to create one but have no prior coding knowledge then this is the theme for you. You can edit different aspects of the homepage easily. The theme can be easily customized. This creatively designed one page parallax WordPress theme is one that is a visual treat. 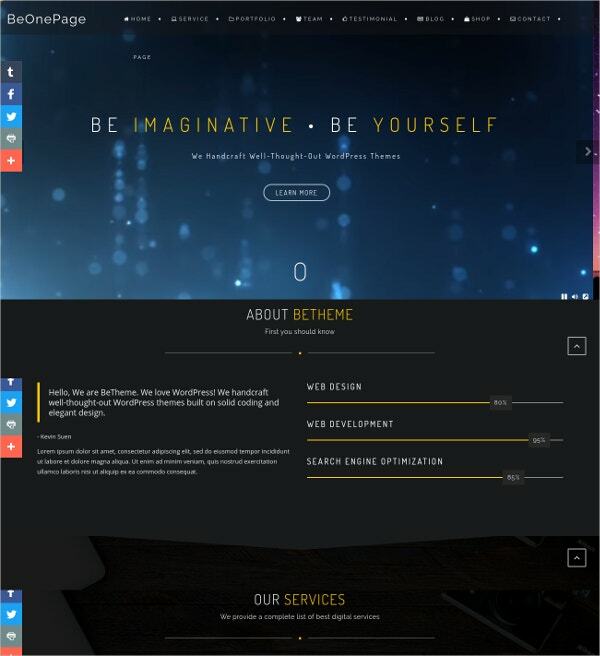 Viewers are sure to love the website created using this theme. You can upload high resolution videos and photos on this website to make sure visitors get a clear idea of your project. This theme has a basic and a professional version. The basic version is for free! The professional version has multiple extra features including 650 Google fonts, 8 page templates and icon packs. 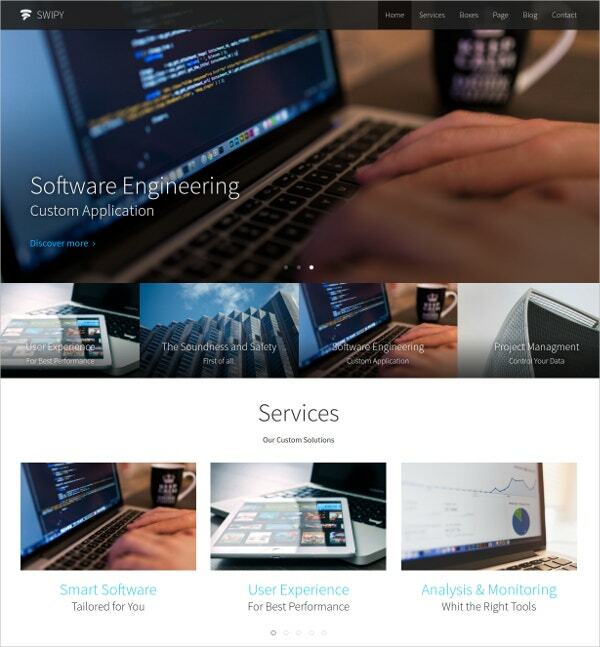 If you are a IT based company and looking to make a good website then this is the perfect one page parallax WordPress theme for you. 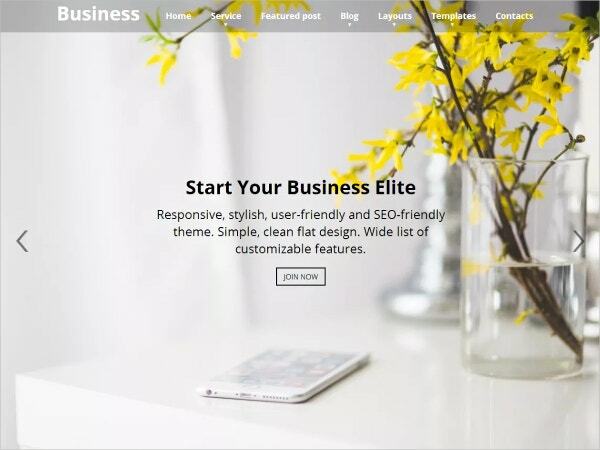 Large businesses can also use this WordPress theme to make a website describing their work. This theme has a free and plus version. The free version has widgets, is easy to customize and is touch ready. The plus version has widgets for products and services and customized logos and many other features along with those of free version. This is a very well designed one page parallax WordPress theme best suited for businesses, product showcases and digital agencies along with freelancers. It has a very professional look where you can give details about the work as well as members of your organization. It has both free and plus versions, with the plus version having additional features like contact section and Google map section. If you want to make a website to promote your business and acquire new clients as well, this one page parallax WordPress theme is the one for you. This is a fully responsive theme suited for mobiles and tablets as well. The search engine optimization is sure to generate a lot of traffic on your website and in turn boost your business by giving it endless promotion. These various responsive WordPress themes are the best option you have for a hassle free creation of a website. Using these themes you can easily create your website without having to write thousands of lines of codes for each part of your website. The above mentioned themes are the highest rated themes available with the most affordable prices. Choose the one that best suits your need and in no time you will have your own website.